LONDON, England (CNN) -- The brother of a convicted British drug smuggler facing imminent execution in China has pleaded for authorities to show compassion amid concerns over the man's mental health at the time of his arrest. 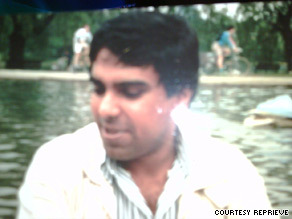 An undated photo of Akmal Shaikh, provided by legal charity Reprieve. Akmal Shaikh was arrested carrying a suitcase containing 4 kilograms of heroin at Urumqi airport in northwestern China after arriving on a flight from Tajikistan in September 2007. The 53-year-old claimed he was given the suitcase to carry by another man who had duped him into believing he was traveling to China to become a nightclub performer and was unaware of the drugs concealed inside. He was convicted and sentenced to death. But campaigners for the UK legal charity Reprieve have revealed bizarre details of Shaikh's erratic lifestyle prior to his arrest -- including traveling to Poland to start an airline and then on to Central Asia to become a pop star. They say he may be suffering from bipolar disorder, a severe mental condition characterized by delusional and manic behavior and claim Chinese authorities have refused requests for Shaikh to be examined by a doctor and for his mental condition to be taken into account during his trial and sentencing. Following the failure of one appeal to the People's High Court of Xinjiang, Shaikh's last hope of avoiding execution by gunshot rests with China's People's Supreme Court, Reprieve Director Clive Stafford Smith said. "This is really a desperate situation," Stafford Smith told reporters Tuesday. "They need to take into account the mental disorder of this man because he's about to face the very last appeal." A spokesman for China's Ministry of Foreign Affairs told CNN that Shaikh's case was being reviewed by the Supreme Court "in line with Chinese law." "The British Embassy and a British organization proposed to have a psychological exam but could not offer any proof of mental illness," the spokesman said. "The defendant himself said that his family does not have a history of mental illness. So the relevant information and case are undergoing legal procedures." Shaikh's brother, Akbar Shaikh, said his family had lost touch with Akmal several years ago when he left London, where he had been running taxi firm, and moved to Poland with plans to set up an airline -- despite lacking any money to do so. "He is a kind person who got involved in some bad habits ever since he went to Poland. He always had more or less acted irrationally in his mind, the way he talked to the rest of his family. One minute he could be very charming, the next he could fly off the handle." While living in Poland, Shaikh was approached by a man who helped him write a song which Shaikh believed would bring world peace, according to Reprieve. The man said he knew people in Kyrgyzstan who could help him become a pop star. Once there, Shaikh was introduced to another man called Okole who told him he owned a nightclub in China where they would launch his singing career. The pair traveled together to Tajikistan, staying in a five-star hotel. Okole then told Shaikh he would have to travel onto China himself because there was only one seat available on the plane -- and gave him the suitcase to carry, according to Reprieve. A forensic psychologist who has studied the case said he strongly suspected Shaikh is suffering from a severe mental disorder. Dr. Peter Schaapveld traveled to Urumqi earlier this year for Shaikh's appeal hearing but was unable to meet Shaikh or attend the appeal. He said British consular staff told him court officials had been "bemused and amused" by Shaikh's "incoherent" testimony. Schaapveld also examined hundreds of pages of rambling emails sent by Shaikh to the British embassy in Poland and various public figures including then-U.S. President George W. Bush and Paul McCartney. He said the evidence "very clearly" suggested Shaikh was "probably suffering from bipolar disorder and may also have an additional delusional psychosis." Stafford Smith called on British Prime Minister Gordon Brown to appeal to Chinese Premier Wen Jiabao for leniency in the case and said China's legal code provided plenty of scope for a defendant's mental health to be taken into account during both trial and sentencing. "We do think it is pretty urgent that the British government does all that it can to save this man's life. I very much hope that the prime minister has contacted the president," said Stafford Smith. "I have represented over 300 people in death row cases and when you are looking at the very worst of the worst people who, in some people's eyes, should perhaps face the death penalty, that does not include people who are mentally ill such as Akmal." A spokesman for the British Foreign Office told CNN that the UK government "strongly opposes the death penalty in all circumstances" and was "greatly concerned" by the case. "The government has already made representations to the Chinese authorities at the highest levels; representations continue in both China and London," he said. "The Prime Minister has taken a personal interest in the case and has raised it several times with the Chinese leadership." CNN's Jo Ling Kent in Beijing contributed to this report.